Right at the start of this document, we stated that social enterprises were organisations that were selling products and services and making profits. Sometimes, we can baulk at this notion, particularly if we are more about the social part of our social enterprise. However, even charities make profits. These are often called surpluses, but essentially these are the same thing. We are looking to make more money in a given year than we are to spending that money. When we fail to raise enough income in a given year, we call this a loss or charities call it a deficit. These are the same thing however. This is important for a social enterprise as language can be important with funders and with charity boards and wider stakeholders. As ‘social enterprise’ is only starting to become understood, it is best to use whatever language that suits your needs, however, the goal is still the same. We aim to generate funds from selling a product or a service and to make a profit, not a loss! When you are starting out, every challenge can feel like it is about money. We hope to shed some light on what you need to start to make your social enterprise viable and sustainable. It’s worth understanding how you go about finding investment as well as what potential sources are out there. We want to bring you through the basics here and make sure you have all that you need to start. These types of costs need to be understood in terms of how they are managed, how they are recorded and accounted for, and when raising finance, either as loans or investment, it will be advisable to identify which type of costs you need the finance for. Raising money for assets like property and machinery can sometimes be easier than other fundraising. Partly because, like a mortgage, if the homeowner stops paying back their loan, there is still a valuable asset (the house), that can be taken back by the lender. Covering variable costs can be harder than raising funds to cover assets. Variable costs can be raw materials such as baking materials if you were setting up a bakery. They have value and can be sold but much harder than selling a piece of land or a building. Wages can be harder to find and is generally only raised after the social enterprise is trading and can generate profits that can be used for salaries and workers. This is why in many companies, the owners of the company get very little payment from the first few months and years as most of the costs are going into developing the enterprise. Fixed costs have to be purchased no matter what the organisation does. These costs can be like rent payments. No matter how much work is done or not done, rent will still need to be met. It is important to be aware of these types of costs when building your financial plans. The actual cost: It is important to get a handle on costings and when you are budgeting. When you are trying to work out costs it is usually a good rule of thumb to include the true cost of things. For example, if you need paint for your raw materials and you know where to get paint cheaply with a sale. Finding bargains like that can really help you particularly in the early days. However, if the sale ends or the product runs out, you will have to include the actual cost of the item. Be careful that you are putting in the actual figures as much as possible. The unit cost: You will also want to find the cost of a singular unit or product. For example, if you are selling cakes, what is the cost per unit that you need to sell that cake at to make a profit? As this might sound difficult, it is best to consider the number of products that you might sell in a year. Of course, if you are selling a service, like garden maintenance, this might be broken down into hours. How much do I need to charge the customer, just to cover the costs of the organisation. Sometimes, a unit cost can be both time and an individual product. Whatever unit you break your cost into though, you will need to have a rough idea at this stage. It is OK to estimate at this stage. Working on a unit cost, it is best to find out the total cost of running the social enterprise by the number of units that you can produce and supply in a year. So, you might have 100,000 units that you can produce. Your cost of running the social enterprise is €50,000. This roughly means that you will sell each unit at at least 50 Cent to break even and 51 Cent to start making a 1 Cent profit. Of course, all of this depends on you making sure you meet your volume. If you only make 50,000 units, then your costs could be €1 per unit. It is very important therefore to make sure that you are being realistic in the time and effort that it takes to make those units in the first place. Breakeven is the point where you have made enough of your units to start making profit. You are now bringing in more money that you are spending on making the product and making your social enterprise work. Once you have an estimate of the unit cost of producing your product/service, and the number of units you think you can sell in a given period (usually one year), you can use the financial information you will have gathered during the market research, to work out what the breakeven point will be. So what are your costs in your social enterprise. Take some time to write down the actual costs of running your social enterprise. We have a starter guide but you will need to know the costs that are associated with your organisation. So far you have put down what you will need and some of your costs and expenses. Now we will start to look at how to put these items into a budget. Here we will look at your cash and how we might set up a budget for your social enterprise. Cashflow forecasting is a way at looking at how much cash you have at any point. This is different from profit and loss in that you might make a profit by the end of the year, but do you have enough cash in your bank account as you are trading to get that profit. As an example, if you were selling coffee as a social enterprise, over the year, you might make a profit, however, on the first day, you will be out the cost of the coffee machine, coffee, coffee cups and wages. All of this will cost money. Do you have enough money on hand before you can eventually see a profit? Each row of the cash flow statement will show the income and expenditure for each month. Watch out for seasonal changes. For example, if you sell ice cream, those sales will most likely come in the summer and if you make umbrellas, sales might most likely be in the spring and autumn periods. There might also be a change in heating and lighting for example depending on your social enterprise. Payments for expenditure and receipts from customers should be planned for when the financial transactions actually takes place, so if you pay or receive some bills in advance or in arrears this should be reflected in the Cashflow Forecast. This sample cashflow below is a sample of the first quarter of the year. Opening Balance: As this is a snapshot of your bank account, imagine that the opening amount of your bank statement is written in as the opening balance. The cashflow forecast is structured monthly so all of your income and expenditure in that month will come and go in your account. Closing balance: At the end of that month, you will have and amount of money left (hopefully!). This monthly closing balance will be the money left in your account on the last day of the month. This then becomes the opening balance for the next month. Using the budget: Record all of your transactions during the month and input them into the budget under the ‘actual’ column. If you have forecasted correctly when you need money, you will be able to compare what you forecasted versus what really happened in that month. Use technology: Hopefully it goes without saying that although you can absolutely do this by hand, there are many pieces of technology that you can use, the most common of which is Microsoft’s Excel. You can download template budgets from anywhere online with a simple search. Calculating your profit and loss: If you total the columns and rows, you should find that you have made a profit or loss for that given year. 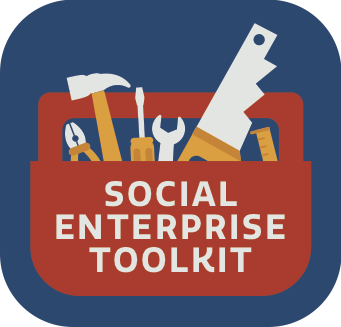 Of course, if you need help with drawing up budgets for your social enterprise, make sure to find help or learn more through the resources that are at the back of this toolkit. Along the way, make sure that you are keeping records. Ultimately, you can be audited at any time by the Revenue Commissioners if you are found being in breach of the law or for just no reason at all. Keeping all records to do with your finances will be help you stay on top of your cash. These include receipts for your customers, all of your invoices, both ones you have issued for payment and those that you have paid. Well-kept records provide vital information for the planning and control of the activities of the enterprise. Financial, and other, problems can be foreseen by regular review of the accounting records and the information can be used to predict changes over the following months. Many enterprises will leave the preparation of final accounts to an accountant; however the day to day bookkeeping system should meet the requirements of the enterprise to provide a useful operating structure. The Bank Account Book and the Petty Cash Book are where all the monies in and the monies out of the social enterprise are recorded. The Bank Account Book is for recording all receipts and their payments into the bank, and all withdrawals out of the bank, whether these are in cash, by cheque, standing order, direct debit etc. All transactions in the Bank Account Book will be exactly the same as those in the Bank Statement and can be crossed referenced to check accuracy and timing of payments and receipts. You will use this book when reviewing your bank statements which come from your bank at the end of every month or while checking them online. The Petty Cash Book is for recording all payments in or out of the float of loose cash that you might have if you have a retail social enterprise. Petty cash is for small cash transactions rather than a cheque or credit card payment, for example for buying small items such as coffee and sugar. Details of each payment should be recorded on a Petty Cash Book and the receipt attached. All enterprises which employ staff must keep a record of wages paid, showing gross earnings, and deductions for tax, PRSI, and pension contributions. These are books that are ‘sub-books’ of the main Bank Account Book and should be used if there is sufficient transactions in any of the areas described below. A Sales Day Book – for recording sales invoices In the case of a retail enterprise selling without credit there is no need to identify customers. A till can be used and the total of each day’s takings recorded in the Sales Day Book. A Purchase Day Book – for recording invoices for purchases and services provided. You may only need a purchase day book if you have a lot of purchases or transactions with suppliers, otherwise the purchases can be directly recorded into the Bank Account Book. If you are using a professional accountant, best to ask them which system is best to use if you haven’t done financial recording before. Professional help at the beginning of your journey can be of real assistance in your day to day but also to understand the tax that you would deal with when you are trading. If your turnover exceeds a specific threshold in any 12 month period then you will have to register for VAT unless your particular product or service is exempt. It may be beneficial for you to register early if you supply to business customers only. If not, you will need to plan for the impact it will have on your profitability. Check to see what the latest threshold amount is now as it can vary each year. Value Added Tax (VAT) is a tax charged on the sale of goods or services and is included in the price of most products and services that we use every day. There are currently four different rates of VAT in Ireland. Standard rate of VAT 23%. All goods and services other than those specified as being exempt, liable at the zero, 4.8% or 13.5% rates. Social enterprises trade largely the same as normal companies. They manage budgets and file returns like all other company types. But social enterprises do more. They provide social value. It is important that the cost of that social impact is measured and is recorded financially too. Social impact can happen in many ways, including by donating profits or spending extra time and money on training for example. This can cost extra. Recording a monetary value will help you with proving your social impact. If the social enterprise spends time then it is a labour cost and the value of the time spent should be recorded at an appropriate rate. The same goes for giving a room for free to a charity group or some other donation in kind or expense. If the social enterprise gives a percentage of its profit to a particular cause, it would be good to know this in advance to help with planning. Pricing: Even after your competitor analysis and your budgeting work, you might want to price your product below market value. You might feel it is not fair to charge your customers with such a profit, but have confidence in your product or service. Apart from anything else, it is also harder to increase your price once you have sold it at a lower initial offering and you will struggle with customers who will now know your margins. Be transparent: There is a fear that if you slip with a payment that you will want to bury your head in the sand. Don’t push people away and try to explain to your debtors or customers in advance if there is a delay in the product or in a payment. If you were owed money, you would not want to have radio silence. Try and bear that in mind. Credit lines: It is possible to better manage your cashflow if you work with creditors and their payment terms. For example a supplier might need to be paid in 10 days for their invoice while others might require 30 days payment. Negotiating with your creditors could save you money and allow you to plan your cash better.